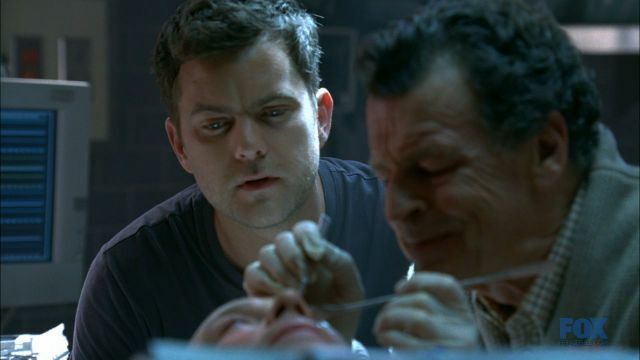 Fringe Summer Rewatch: #304 "Do Shapeshifters Dream of Electric Sheep"
Join us for ourFringe Summer re-watch, where we review every episode of Fringe during the summer hiatus. Comments are welcome as we dig into the connections made over three seasons. "Do Shapeshifters Dream of Electric Sheep" was an episode of deception and close calls. We start off at a restaurant with Peter and Olivia laughing and playing a game after they've already finished dinner. The game is: who/what other people are which in my opinion is kind of ironic as they're trying to see past the exterior of their fellow restaurant patrons to who they really are when the biggest fraud in the room is Olivia (who is wearing bright blue). When they go to leave, Olivia asks for a moment to use the bathroom and we see that it is getting harder for her to keep up the charade with Peter. Pan over to Senator VanHorn who is buying lemonade from a stand run by two neighborhood girls who know him buy name. When he drives off he is too distracted with the sight of the girls in his rear view mirror and is broadsided by a truck and rushed to the hospital. Broyles meets up with Patricia, VanHorn's wife and he demands to know what is happening to his friend when they hear gunshots. Broyles rushes to help only to discover Newton stealing VanHorn before accepting that he won't be able to escape and take the Senator with him and shoots him in the eye before making an escape out a window. Broyles goes to VanHorn's side and is shocked to see that VanHorn is a shapeshifter and not the friend he had known for so long. Walter has his first day at “work” at Massive Dynamic and our first taste is of Walter lecturing a group of scientist while “tripping” and also stripping. Peter and Nina interrupt before he gets too carried away saying there's a case. They meet up with Broyles who relates the details, but Walter (who does his best working while tripping out) is still high and tells Olivia, “Your hair is like gold diamonds in the right light”, perhaps a play on the glimmer from the other side as he’s staring at her hair. Olivia takes an out and calls Newton to ream him for his mistake when he fires back that he's pretty sure Peter is onto her already or will be if she doesn't start playing her part better and though she seemingly brushes off his accusation, she seems slightly shaken at the idea of her cover being blown. While Olivia and Peter are searching Van Horn's office he finds a suitcase with the background of every fringe agent and the panic is really beginning to set in for Fauxlivia. They meet up with Broyles to discuss the ramifications involved with this discovery and end up at Massive Dynamic. Newton wakes a sleeping shapeshifter from undercover and gives him the mission of stealing a shapeshifter-VanHorn’s body from the 23rd floor of Massive Dynamic. This shapeshifter, named Ray, is posing as a family man with a wife and a seven year old boy. He’s been undercover now for five years with the family and appears to be attached to the family, especially when Newton orders him to kill the family when he’s finished. It begins to hit home to the Fringe gang that the shapeshifter infiltration could be worse than they thought and Broyles has authorized tests for anyone high enough in the government. We discover that Walter has found a way to get the answers they need, simply by asking shapeshifter Van Horn who is having a reaction to pictures of Van Horn’s wife. Walter theorizes that the shapeshifter had to pretend to have an emotional connection with VanHorn’s wife to make it believable and ended up falling for her, making the emotional attachments real. Ray talks to his “son” before leaving to do his job and they discuss how monsters aren’t all bad and sometimes they are capable of great love and good. Patrician VanHorn talks to the shapeshifter who has posed as her husband and she tries to get a reaction from him and once she begins talking about the family they begin to map out the activity to the base of his spine. When she talks about forgiveness, he seems to wake, repeating a code of sorts that ends up being information about their anniversary. Peter ends up pulling the plug on the shapeshifter when Patricia begins to freak out over the words he’s saying. Olivia then receives a text saying that they need to leave the floor in 15 minutes before the body is taken care of and talks Walter and the others into grabbing a snack at the cafeteria for a break. When in line for food Astrid mentions animal cookies and how Walter loves them, but Walter is adamant that it was William who loved the snack and not him and goes on to talk about how a stegosaurus’ was William’s favorite dinosaur and then freezes up when an idea hits and he tracks back to the 23rd floor, meeting Ray in the elevator who looks as if he might make the switch for Walter’s body but changes his mind as they get to the floor he’s supposed to end up on. That could’ve been one more person just playing a role. The shapeshifter kill the security guard and only knocks Walter out after Walter tries to kill the shifter with a knife. This makes me think maybe there are orders to keep Walter alive out there, because the shapeshifters have been more than ruthless in the past and this change doesn’t seem likely if there wasn’t. Meanwhile, Peter and Olivia are talking and he poses that Patricia must’ve have noticed something was off with her husband after two years of the switch, just like how he had noticed the changes in Olivia since they had come back. Originally watching this scene I could’ve sworn Peter had figured it out and he really did just like Fauxlivia more than the original, but it later becomes clear that he didn’t know. He does claim to like the changes he’s seen and how it’s not bad, just different. When Peter and Olivia realize that Walter isn’t with Astrid, Peter panics and they rush to get to the 23rd floor when the shapeshifter exits the elevator just as they are entering it and Peter is the one to notice the mercury blood on the elevator buttons and make the connection. They split up so that Olivia can “follow the shapeshifter” and Peter can check to see if Walter is okay. When Peter finds Walter unconscious and dazed the relief Peter feels and shows is just an example of how far they have come already since the end of season where Peter was still angry with Walter for what he did. After Peter goes through the security videos they track down who it was that stole the disc. Meanwhile Newton is waiting for Ray back at the house and asks why he didn’t shift after he’d been told to and Ray said it was unnecessary and that he had gotten the disc anyways. Newton tells him that he already took care of the family and Ray freaks out and Newton says that he was lying. He goes on to explain how he couldn’t understand Ray’s attachment to the family and asks Ray to move on to another life. When Ray refuses Newton kills him on the spot and drags his body into the trunk of his car. Peter and Olivia arrive at that moment and a car chase ensues. Newton’s car flips in a tunnel and they’re able to apprehend him, but not before Fauxlivia steals the disc from him. Fauxlivia brings Newton a chip and he lectures her on how she's not willing to cross the last line to make her cover stick and Olivia is unable to deny it and she leaves him before he continues. Newton slips the chip into his mouth and begins convulsing and dies in his cell. Fauxlivia send Peter a text that they need to talk at her place. When he arrives at her place she tells him that she lied and that doesn't want to talk and they proceed to make out against the wall and we find that she isn't so unwilling to cross that line as she thought. Why did the shapeshifter not kill Walter? Did they end up getting the disc from Ray who was still in the truck? Check out the song "Alive" by Superchick if you're interested, as all I can think about during this episode is this song and it sounds ever so Fringe-esk. Walter may not have found his focus he needed to get the case solved and Fauxlivia would have one less person to convince that she was our Olivia. Fauxlivia definitely wouldn't have had to sleep with a Bishop... or would she? Okay, I'm done cringing and laughing now, but in all seriousness, we wouldn't have a baby Henry after their wild time between the sheets. -Throughout the episode it looks like Anna is sometimes wearing a wig and then not. Hm, very confusing. -Peter: “We all draw our moral lines in the sand. And unless you can put yourself in another man's shoes, I don't think you can really judge their situations.” I think this statement from Peter stuck with Fauxlivia throughout the episode because doubts are coming up and Newton stirred that fire even more. - When Fauxlivia asks Peter to give her a moment, she either was missing Frank, figuring out how she could get Peter, having feelings for Peter or questioning whether she can do this mission. -There is a daisy glyph on the cup Van Horn is holding. -The way Van Horn died, reminded me of 2.17 White Tulip. It’s the same way Arlette Turling died. -Broyles should be more careful with who he picks as friends. First Loeb, now Van Horn. -Newton: now that’s what I call a cold blooded killer. It’s interesting that he didn’t kill that last nurse though. -When he was holding the gun to her head and said: “I will kill her.” That resembles the way Fauxlivia was holding a gun to the woman’s head in 3.08 Entrada. Even the way he said that, sounded like Fauxlivia. -The way he escaped reminded me of how the nurse escaped in 2.01 A New Day In The Old Town. -When Walter plays with Fauxlivia’s hair, I wonder if it glimmered. He was high, after all. -Love the conversation between Newton and Faxulivia. Again he’s the one who can rattle her feathers. It’s also interesting that Newton doesn’t know what Fauxlivia’s assignment is. -Mad Hatter; reference to Alice in Wonderland. -Tin Can; reference to Wizard of Oz. -I can’t believe she used Rachel’s name. I wonder if Rachel would have been able to tell the difference. -I really liked Ray. What a contrast to Newton. I wonder if Newton had not been a frozen head for so long, would he have been more human. -So Van Horn already was a shapeshifter in 2.06 Earthling. -Love Anna’s play with her eyes throughout the experiment with Patricia. -Fauxlivia was trying really hard not to give them a chance to find out more. Olivia wouldn’t have dismissed the idea of using Patricia so easily. -In 2.06 Earthling, Van Horn’s first name was Dennis. -Patricia: “I've been thinking of all the years we had. I know it wasn't always easy. I'm sorry I didn't know... you were gone. I - I don't know how I didn't know. You would have known. I-I know you would have.” Would he? -When Walter came out of the elevator, the first time I saw this, I really thought he was shape shifted into. Phew, I’m glad he wasn’t. -Man, when Peter talked about noticing the differences, I really thought he got it. But… he was just explaining them away. -When Walter stabbed Ray, some said before he did in cold blood. I disagree. His demeanor is so different from (i.e.) killing Hoffman in 2.13 The Bishop Revival. Plus his expressions don’t strike me as that of a cold blooded killer. -Astrid’s concerns for Walter mirrored those to Walter’s concern for her in 2.09 Snakehead. -Fauxlivia is an excellent shot. So she missed on purpose. The shot out tail light reminded me of 2.19 Brown Betty where Olivia broke Nina’s tail light. -Newton’s cell number: CB3-04 as in season 3, episode 4. -Fauxlivia: “I can befriend a vacuum cleaner.” Later in 3.06 6599 kHz she thinks the First People invented them. -Newton: “…Words like, integrity, self-respect - they haunt you. They form a line that you're unwilling to cross…” Was Newton pushing her again? Is that why she slept with Peter to prove herself? There are others who have crossed a line as well: Walter and Bell. -The movie playing on TV at the bar; is that the same one playing in 2.12 What Lies Below, just before Peter gets tested? -I’m surprised that Newton accepted his fate so readily. -Love the music at the end of the episode; Newton’s death song. Or shall we call it something else? It plays again when Peter looks at the photos after they capture Fauxlivia in 3.08 Entrada. -Grrr, Fauxlivia! And in Olivia’s apartment. Who would have made the suggestion to Walter to try to fix Van Horn? -Would someone else have found the box with the files on each? -Would Ray be still alive and for that matter Newton as well? Fauxlivia would have not slept with Peter and therefore baby Henry wouldn’t exist. Or did he ever? You both got me laughing inwardly. This is one of my favourite episodes! - Movie at the bar and at Vitas was the same "Forbidden Planet". Either of you think maybe Newton isn't quite like the shapeshifters? That would explain his attitude towards people in general. :) yes I meant Tin Man but Walter's line is actually tin can. I did this late last night and stopped half way through cause I couldn't concentrate anymore and finished this morning. Newton: Well yes I think so because he was out of commission (frozen head). We don't know how long. He's been over here for about 10 years. Ray says he hasn't seen him in 5, so how much human contact did he really have. And if any who was that human contact? Can someone clear this up for me.... In another episode when Charlie was a shape-shifter and 'Charlie' didn't have his little mouth connector thingy to transform out of 'Charlie', Newton (I think it was), said that shapeshifters aren't meant to live long in a human body, yet it had only been a few days that 'Charlie' was tranformed and he was already dying. How did this other shifter manage to last in that body for 10 years?? Remember what shifter Charlie did? He ingested mercury. I imagine that's what sleeper agents have to do to keep their human identities. In episode 3.18 Fauxlivia was unable to get a lady, who was cleaning the floor with a vacuum cleaner, to help her. Fringeaddict, the shapeshifter was wounded, when he took Charlie's form. It's not that shapeshifters cannot live forever in a human body, it's that in this case, he needed a healthy one. The whole point of this episode is simple. Shapeshifters develop genuine feeling by playing a role they are initially faking. Same thing with Altlivia and her feelings with Peter. She has to let down her guard so she seems genuine and she develops real feelings for him.